The leader of our most faithful and trusted ally comes to Washington to warn of a mortal and rising threat from a dangerous and deceiving enemy. The President of the United States refuses to meet with him. The President sends his VP out of the country to avoid our ally. The President sends the Secretary of State out of the country to avoid our ally, and instead to meet with our enemy. The President refuses to allow any of his Cabinet Members attend the speech by our ally. The White House pressures Members of Congress to boycott the speech of our ally. The President’s first comment after the ally’s speech is that he didn’t bother to watch or listen to it. Yet this is exactly what is happening. Truth is stranger than fiction. Now comes the news that even though President Obama is bending over backwards to make concessions to Iran, the Iranian leadership has now utterly rejected the President’s deal, calling it “unacceptable.” That’s the first thing Iran and Israel have every agreed on. More on that in a moment. A radio host asked me this morning: Did Israel’s Prime Minister come to Congress to boost his political fortunes because he’s in a neck-and-neck race back home? No. That’s not it. Mr. Netanyahu came because he believes Israel is in mortal danger if Iranian leaders driven by “Apocalyptic Islam” are able to build atomic weapons and the high-speed missiles to deliver them. Netanyahu knew there was a huge risk in coming to the U.S. amidst such controversy. But he also knows that if he does not come back to power as Prime Minister after March 17th that he would never be able to forgive himself if he failed to use his time in office to raise the alarm and urge his friends, the American people, to stop Iran from getting The Bomb, rather than putting Iran on a legal pathway to The Bomb. The Bible says in Ezekiel 33:1-9 that if the watchman on the wall sees a threat emerging, he must warn people, or he will be held to account. In the Bible, Mordechai urged Queen Esther to intercede with the King to try to save the Jewish people. She bravely spoke the truth to power. The Bible tells us that God sent Moses to speak to the Pharoah to save the Jewish people. Moses risked his life to speak truth to power. In the 1930s, Winston Churchill warned of the gathering storm of Adolf Hitler & the Nazi Third Reich. Few listened but Churchill was right. In the 1960s & 70s, Ronald Reagan warned us of the danger of appeasing Soviet communism. Few listened, but Reagan was right. True “watchmen on the wall” often walk a lonely journey. But they are motivated not by crass personal ambition, but by deep personal conviction. Now, back to Iran rejecting the President’s deal. “Iran will not accept excessive and illogical demands,” Zarif was quoted by Fars as saying. 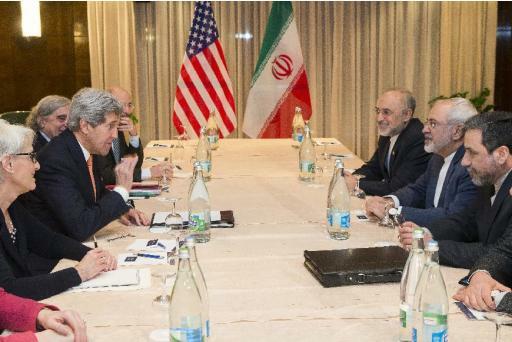 Wouldn’t it be ironic if Iran saves us from this dangerous, disastrous deal?